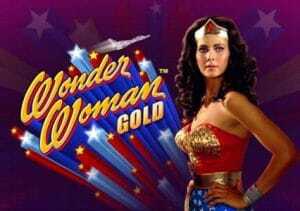 Based on the cult 1970s TV series about a super heroine in her “satin tights, fighting for your rights”, Wonder Woman Gold is a 5 reel, 40 payline video slot from Bally Technologies. Special powers on offer her include mystery stacks, expanding wilds and a bonus feature where you can win up to 25 free spins. Play from between 40p and £200 per spin. Wonder Woman first hit TV screens the best part of 40 years ago and that retro feel is evident in the visuals in the slot version. If the imagery harks back to the past, the features are very much of the present. First up is the Mystery Stacks feature – these mystery symbols can hit in the base game and transform into the same symbol to create bumper winning combinations. As you’d hope, Wonder Woman herself possesses some magical powers – she is the game’s wild, replacing all other symbols bar the scatter. When she lands anywhere on reels 2, 3 or 4, she will expand to turn the whole of that reel wild. This is known as the Expanding Wild feature. No matter what option you choose, the expanding wilds will be in play throughout your free spins! A trio of jackpot prizes are also up for grabs here – to trigger them, you need to land the star symbol on reels 1 and 5 on the same spin. The chances of winning the Mini, Minor or Major jackpot depend on the stakes that you’re playing. If you get frustrated waiting for a feature to hit, you can always jump the gun by using the Buy A Bonus feature – you’ll be offered a price which you can choose to accept or refuse. The original TV show hasn’t aged particularly well but the video slot is a decent enough re-boot. Nicely designed and coming with plenty of features, there’s plenty of enjoyment to be had, satin tights or not! If you like superhero games, there’s plenty about with NextGen Gaming’s Justice League a good option.